← The Fed’s QT Blunder And Libor’s Warning. Just variability year to year will change ALL of the projected results. Have you allowed appropriately for taxes and inflation? “Business Plan for Life” changes the focus. While I was doing actuarial exams in the UK I decided that the best way to learn about pensions was to join a pension consultancy. However, when you make a big career change like this, you will either make a great a transition or else learn something important. For me it was the latter. The auditing of Defined Benefit (DB) pension funds made no sense to me. It was essentially a financial and retirement plan wrapped up together in what, years later, everyone came to realize was a failed system. DB plans initially appeared to be such a great idea. However, as ever with any system, it is the structure and incentives of people within the system that will ultimately define the outcome. The above chart shows that in the end these plans did not work out well and soon went into permanent decline. The huge problem with the Actuary audits I worked on, was that even minor plausible changes in the assumptions dramatically changed the projections and the bottom line. So, the supposed financial strength of the pension plan was essentially determined almost solely by assumptions, not reality. Perhaps this was easy to overlook. After all, the plans were complex and had multiple assumptions available to adjust. However, as I worked on the plans, I saw the extreme sensitivity of the bottom line as the assumptions changed. I was shocked and concluded that any single result did not provide much valuable information. The Actuary who presented the numbers to the company CEO/CFO was able to present an optimistic assessment in almost all cases and, of course, this was good for repeat business! However, it failed to provide a realistic long-term guide for the appropriate measures to be taken for the long-term financial health of the plan. Equally, for the CEO/CFO, the long term financial strength of the pension plan was not likely to be the first priority, and any cost concession on contributions to the plan would end up boosting company earnings, at least in the short term. Overtime these incentives together with confusion over the robustness of the calculation methodology contributed to deteriorating plan performance. DB plans seemed to come up short time and time again. 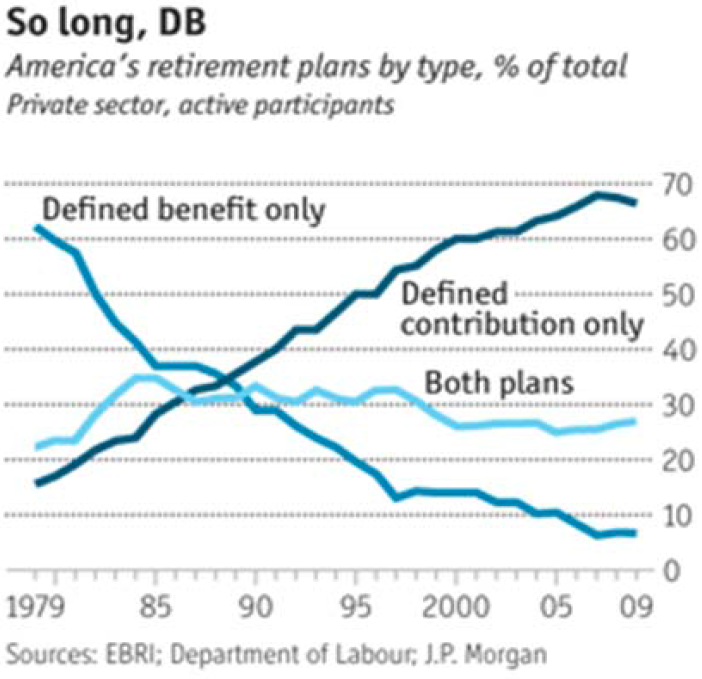 As the chart above shows they eventually became increasingly abandoned in favor of Defined Contribution (DC) plans. Abandoning DB plans in favor of DC plans at least took away the roles of the Actuary and the CEO/CFO, neither of whom really had skin in the game. However, most of the same assessment issues remain as regards determining the long term successful health of any financial plan. With DC plans, now the assessment falls solely on the financial planner as well as the individual on agreeing to the assumptions and ultimately also on the assessment. 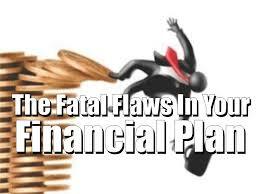 However, be aware, the financial review is still subject to the same problems with assumptions and projections. This increases the vigilance and understanding needed by the individual investor. There is no longer a corporation responsible for any shortfall which will ultimately fall solely on the individual investor. Does the advisor and the individual investor really understand what the assumptions and projections say about the bottom line? Can you be sure there is no bias to the setting of assumptions? Setting Assumptions. Inevitable But Dangerous. Handle With Caution. 1. It is almost meaningless to look at just one result from just one set of variables and could be completely misleading. If there is value in this approach it is in learning about the sensitivity of the results to the assumptions, before coming to any conclusion. 2. The projections typically assume simple constant rates projected year after year. However, each year will turn out differently from what was assumed, so continuous assessment is necessary to ensure plans stay on track. Also be aware, as discussed below, that in reality the variability of the returns will LOWER the investment results compared to projecting the same return every year. 3. In fact this is true of ALL projections. Just variability year to year will change ALL of the projected results. Unless your life is the same every year for the next 30 years All the actual results will be different. 4. 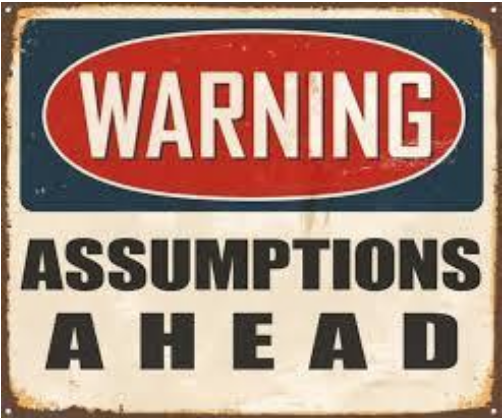 Also, make sure also that all the key assumptions are included. 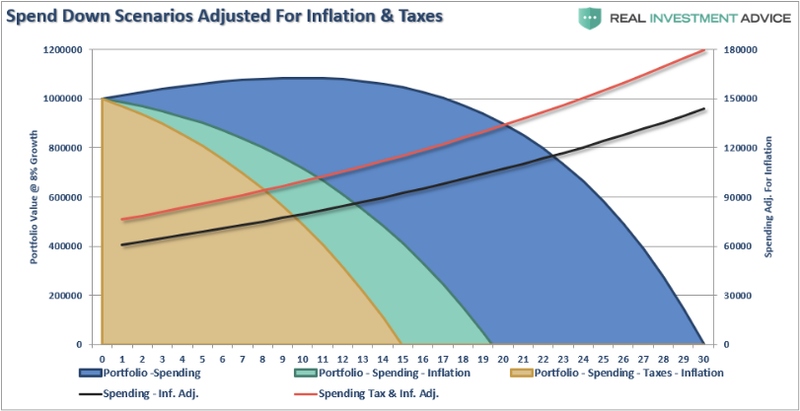 Taxes and inflation make a huge difference, as illustrated in the chart below. Even with all these steps in place, this is a complex exercise with significant uncertainty, and needs careful judgement and periodic attention. Furthermore, it does not take full account of the complexity and dynamics of people’s lives. The financial situation is important but may not be the most appropriate lens through which to look at someone’s real life choices and goals. Finances may help set parameters but they are rarely the most important starting point for life planning. So far this has all been just a financial exercise. Much of the data is made up of assumptions, and many of the factors can’t be changed by the individual. Is it appropriate to consider a life mainly as a function of finance? Or, while accepting that finance is important, wouldn’t it be better to start from the perspective of a person’s life? 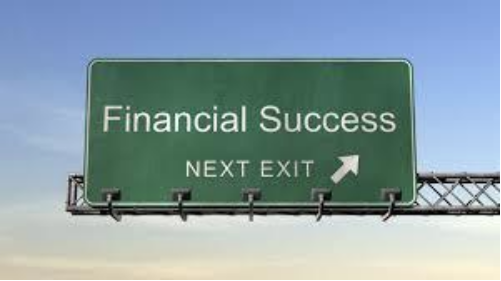 This is a different mindset and fundamentally changes the orientation of financial planning. All the financial points discussed above can be considered, but the most important focus should start with who the person is and what they want or need. This is what the individual can change in a way suitable to them, and finances will inform but follow life choices. Once an individual has purpose and direction, finances have context and meaning in service of a person’s life. This is not just more realistic but may also be a more productive perspective. Much of the complexity and confusion of standard financial planning approaches become more a back-up tool, when necessary. 30-year projections could become irrelevant, for example, if the individual’s life is likely to encounter a range of changes over the next year or so. In a business plan for life, a current assessment can be made more clearly in the present and adjusted in real time in line with real life dynamics and personal development. Certainly, there should be a current analysis of cash flow, tax planning, investment planning, and estate planning but this process need not be too dominated by assumptions and projections. Each life choice and its financial consequences can be singled out separately and perhaps more accurately with more focus. Breaking down the process in this way makes the analysis both more realistic, easier to understand, and more helpful in setting near term direction and action plans. Instead of focusing on returns investors may well be better served by first examining risk. Risk management is crucial for 2 important reasons. First any significant drawdowns materially damages long term returns. The table below shows that a 20% loss in any year would not be made up until a subsequent 25% gain was made. The bigger the drawdown the bigger the return needed just to breakeven. A 50% loss would only be made up by a subsequent 100% return . What this means is that arguably the most important investment factor, is to ensure as far as possible, that any large loss is avoided. Secondly, and this is very misunderstood …. 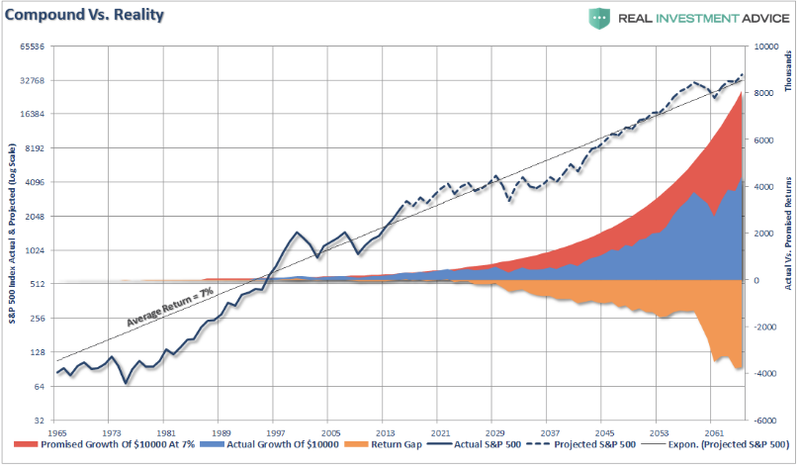 “as shown in the long-term, total return, inflation-adjusted chart of the S&P 5oo below, the difference between actual and compounded (7% average annual rate) returns are two very different things. The market does NOT return an AVERAGE rate each year, and one negative return year compounds the future shortfall. The chart below shows the effect of this over a 100 year period. A relatively normal level of return volatility shown in the chart takes away almost half of the 7% average compounded return! Obviously the more volatility there is in the return the greater the shortfall will be. Both these effects reinforce the importance of stable and consistent returns, which can only be achieved with a focus on significant risk management and an appropriate risk management metric like RVAR, Repeatable Volatility Adjusted returns. Investment conditions have been historically unusual since 2008, with record low interest rates and exploding debt growth literally never seen before. The recovery has also been one of the longest in history, but also one of the weakest. This period has been so exceptional that projecting the next 10 years investment returns on the basis of the last 10 years is not a good basis for any plan, as it is very unlikely to be repeated. If you set your expectations too high it can lead to insufficient savings, too much risk and/or poor allocation choices. This is a complicated matter and needs clear thinking. Many of the important points are in this article by John Hussman. 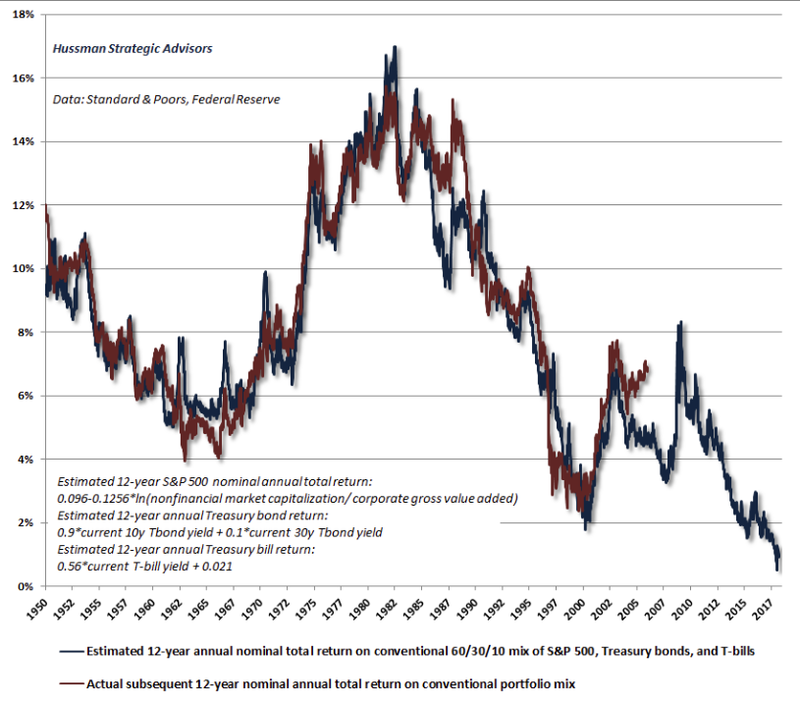 Please be aware that the most accurate measure of expected 12-year returns, with its track record since 1950 shown, currently projects the lowest 12 returns since 1950 at around 1% nominal, for a 60% equity, 40% bond allocation. This reinforces the care that needs to be taken in setting long term return expectations, and also the comments made above about risk management.